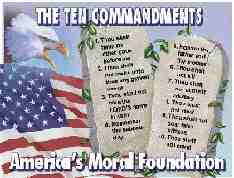 Ten Commandments Day Observe it in May. and New Full Color Picture! Judge Roy Moore, So Help Me God, describes the providential events in Chief Justice Roy Moore's life leading up to his removal from office, as well as providing a thorough explanation of "separation of Church and State" and the true "rule of law. (CLICK ON BOOK)"
Over 2,000 churches have distributed 50 to 100 yard signs in their communities. Georgia churches leads the nation with 21,925 yard signs scattered across their state. As the battle rages to acknowledge God in public places, as the Supreme Court decides if the Law of Moses can stay in court houses, these yard signs have become the banner of the battle. Churches all over America are becoming a lighthouse to their community by displaying Biblical law. Is your church next to shine and display the sign? To print a photo or pictures or to make a printable copy, Printable copy of the Ten Commandments or to see a list of them. List of Ten Commandments. The very Christian historical foundation of America is at stake. If we lose this battle, Christian Monuments and Christian historical symbols could be removed from thousands of public places in every city in America. You will find Information on legal issues, the Supreme Court, and the Ten Commands of the Bible on this page. Also on this page are several pictures or photos, as they are found in 3 places in the Supreme Court Building. Judge Roy Moore writes article, "Will America choose to acknowledge God?" Former Alabama Supreme Court Chief Justice Roy Moore defied an illegal court order by refusing to take down a the monument from the Supreme Court building, and the federal court removed both him and his monument. 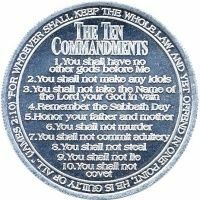 The Ten Commandments in the Bible have been attacked in Kentucky, Indiana, Ohio, Alabama, Georgia, and all across the nation! Christians have responded and have put up a copy of thousands of yard signs throughout the country. It is inspiring to drive down a street and see one yard after another with these inspiring yard signs. Your neighborhood needs to be next! Help us put the God's moral law back up across the nation by erecting them in your yard, wearing them on your shirt, or supporting them with a sticker on your car. Jesus is Lord. Is Jesus Lord of your Life? We are looking for like-minded, conservative organization to be linked to our web site. If you find any errors or broken links please e-mail us. Music and songs of the Ten Commandments! The summary of the Bible Commands are now set to music verbatim. The copy of the words are God's own, written out to his creation, you and me. We can build a world with love, obeying his commands. The musical is available for all to use as public domain. Also copy of music for Ten Commandments Song contest. Musical information and free memory tools to help children to learn the Ten Commands thru song and music. Ten Commandment Music. The summary of the history is important to understand the meaning of what are the Commandments. On this web site you will find a photo and clip art or coloring pages clipart. There are also Indian, native American, and Cajun tablets as well as activities for children and kids. Moses is our lawgiver, who taught the principle of theonomy, but Jesus taught us the summary of the law, which is the golden rule. The 8th Command is, "Thou shalt not steal". The phrase, "Thou shalt not" is mentioned seven times out of ten. It is mentioned in the second, third, sixth, seventh, eighth, ninth, and in the tenth. The first command is, "Thou shalt have not other gods before me". They are original and listed in Exodus 20. What is their purpose and the meaning of them? Define them, name the ten and other sermon information information is on this internet site. We have Sunday School lessons for kids and children. Ten Commandments Sunday School Lessons We also have more Sunday School activities, crafts and lessons. Also on this page is a printable copy. Moses and the stone tablets Commandments See Moses and the finger of God write upon the stone tablets. What are the seven deadly sins listed in the Bible. Seven Deadly Sins An interesting historical perceptive from the middle ages, of the Seven Deadly Sins listed in the Bible. What are list of the evil sins of the Bible? List of the Seven Deadly Sins of the Bible Are you guilty of violating the moral law and one of the sins? Yard Signs -- Maker of yard signs, T-shirts, and bumper stickers. We make yard signs and T-shirts of all types. The lowest prices for yard signs for conservative candidates and conservative causes. George Gordon's School of Law George Gordon is the nation's foremost teacher of courtroom strategy and procedure. How do you apply Biblical law in the courtroom. 28 So husbands ought to love their own wives as their own bodies; he who loves his wife loves himself. 39 And the second is like unto it, Thou shalt love thy neighbor as thyself. The Pro-Marriage t-shirt - Put you faith in action by wearing a Christian pro marriage t-shirt. - FREE shipping on orders of $50 or more! Christian T shirts. Pro Life T shirts and clothing. T-shirts, youth shirts, infant tees, toddler tees, baby doll shirts, pro life bumper stickers, and more. Stunning apparel that is true to the Bible and Jesus Christ. The Conservative T-shirts - Need Christian t-shirts or conservative T-shirts, clothing, or even stickers? Choose from millions of products such as apparel, buttons, and other merchandise. Online wholesale pricing is available so you can get conservative shirts for VBS or fundraisers! What Does the Bible Teach the Christian about Life Insurance? 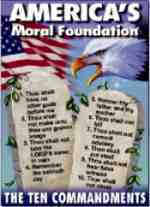 The 10 Commandments Latest News and Info Current Battle over the Commands being displayed in Virginia high schools. For Products and gifts, Christian t-shirts, Christian Car Tags, Christian Car Magnets, Decals, lapel pins and & More! The Stone Kingdom has tablets of stone since the days of Moses. Approved by 85 Counties, Consider asking your county or city council to sponsor this resolution. This verse teaches us that the commands and moral law will last for at least a thousand generations and apply today. Make Jesus Lord, the Lord and Savior of your life. Make Jesus the Lord of your life. Read this historical information on the lordship of Jesus. More info on faith and the Great Commandment. Do put your Christian beliefs into action. 8 Owe nothing to any one except mutual love; for he who loves his fellow man has satisfied the demands of Law. 9 For the precepts, "Thou shalt not commit adultery," "Thou shalt do no murder," "Thou shalt not steal," "Thou shalt not covet," and all other precepts, are summed up in this one command, "Thou shalt love thy fellow man as much as thou lovest thyself." 10 Love avoids doing any wrong to one's fellow man, and is therefore complete obedience to Law. Luther taught us to obey the moral law, preach the gospel and obey the Commands. The concept that the moral law was done away, is a modern concept that was not held by any of the men of the Reformation. The early and middle ages church writings, including those of the Catholic Church, made it very clear of the requirement to teach and obey the moral law. Martin Luther quotes extensively from the Bible. Martin Luther know for Quotes from the 95 Theses. Thou shalt not kill. Thou shalt not commit adultery. Thou shalt not bear false witness.